Hi, I've found a way to tweak colors on Push. All that you need is create a file in your text editor, copy/paste code from here https://github.com/gluon/AbletonLive9_R ... Default.py save it as SkinDefault.py in your /Applications/Ableton Live 9 Suite.app/Contents/App-Resources/MIDI Remote Scripts/Push (this is for Mac, i'm not sure where it's in Windows). After, you just edit this file with colors that you like. Each time when you make any changes in it you have to restart ableton to make them visible. That's what i did at first with mine to get rid of bad led calibration. Btw, who knows a way how I can decompile other Push's python scripts? I'm really new to it. The .shade(1) and .shade(2) extensions seem to set the colours to about 1/2 and 1/4 intensity respectively. 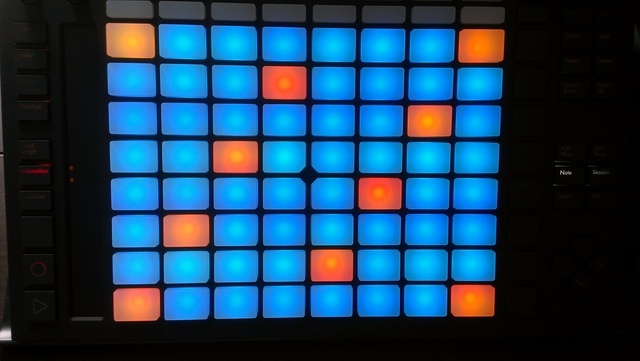 The trouble is many of these colours are unusable due to the random variations, which appear to affect only the blue LEDs - any colours using either the green or red LEDs seem to be uniform across all buttons. My guess is that there was a faulty batch of blue LEDs and consequently I can't find a color scheme that's not garish, as blue is the coolest colour of the three. So my Push is being returned in the morning as I highly doubt these LEDs are individually addressable to the point of being able to adjust small colour differences. I suspect only much large colour changes are possible. I'll wait until version 2 comes out. You're right, blue color looks better than others, but it's not the only one. ORCHID looks dope on mine, LIME is cool. I think it depend on your precise device. also you can use .highlight() to make the color highlighted. without any numbers in parentheses. In order to use it you just copy this file in to /Applications/Ableton Live 9 Suite.app/Contents/App-Resources/MIDI Remote Scripts/Push and restart ableton. To get back to default skin just delete this file. thanks starcat; this is great. your color scheme looks gorgeous on my unit (especially in the dark with the AC adapter plugged in), and is a great point of reference for further customization. love the color scheme, it´s almost perfect. Just one thing. i try to change the color in recording mode in the notes view back to red like in the default skin, because sometimes i miss, that it´s recording. Can you give me a hint please? This is killer! Thanks for the info.... off to change some colors I go! Yea, i've tried to figure it out but with no luck. This should be in another script but a lot of decompiled scripts that i've found over the internet just don't work with my device. I suppose it's because i have newer versions of them and i didn't find the way to decompile them yet. Anyway, it's seems that i'm stuck with creating some m4l devices for push for weekends, it's a lot of fun, but i'll try to find it out sometime later. I have a full range of lighting gels and have tried placing some of them over my Push, and note that when I place either a green or a red gel on top of the buttons that the color variation is almost totally fixed. But when I place a blue gel on top the variations are there to see in all their glory. So I am pretty certain that the problem is simply a faulty batch of blue LEDs. Fortunately my original supplier contacted me today and I have a returns number so I can now send mine back. If Ableton fix this issue with a version 2 I may try the product again - we'll see. Maybe with their 16-week delay for current orders Ableton will have time to source some good LEDs before they get despatched, and other purchasers will be luckier. Where can i find the original SkinDefault.pyc file (for windows) ? I cannot go back to the initial colours since SkinDefault.py has changed SkinDefault.pyc as well. EDIT: i just found the file at lo.key previous post. Just want to throw out a quick thanks to you guys for sharing this info on changing the default pad color schemes. I set up the colors in a way I like and that hides the poor LED coloring well. Everyone I have shown the new schemes to ask me when I had the Push fixed or replaced. The phrase I hear most often is "oh waaaaaay better". So thanks! Actually, I don't understand why Ableton decide to put so much white color in their scheme, i thought that the good marketing strategy is hiding all your cons and emphasizing pros. I think if they were using a scheme without white color they would have not so many complains about it. Bobbyandreano wrote: Just want to throw out a quick thanks to you guys for sharing this info on changing the default pad color schemes. I set up the colors in a way I like and that hides the poor LED coloring well. Everyone I have shown the new schemes to ask me when I had the Push fixed or replaced. The phrase I hear most often is "oh waaaaaay better". So thanks! hey Bobby, would you mind sharing your colour setup? I'm curious to see what it looks like. panten wrote: would you mind sharing your colour setup? I'm curious to see what it looks like. Looking at it here, "NoteForeign" is probably set to the wrong color; an experiment in progress. If I'm not mistaken, that's your "out of scale" notes which only show up in chromatic mode. Haven't found a shade I like for that yet.